It's Groundhog Day. Again. Or maybe not. On May 3, U.S. District Court Judge Michael Simon trashed the federal government's plan for managing dams on the Columbia River and its tributaries, saying it leaves threatened and endangered salmon at risk of extinction. This makes the fifth time since the Columbia's salmon were protected under the Endangered Species Act that a federal court has tossed a biological opinion on the dams. This is Simon's first ruling on the issue, but it built on previous rulings by retired District Court Judge James Redden, who had rejected three previous opinions. Simon's decision preserves the feds record of never having won a round in the court fights. On the other hand, they've largely preserved the status quo -- for more than a quarter century. The idea of tearing down four dams on the Snake River has yet to face any serious federal study. Procedurally, not much has changed with Simon's ruling. The current biological opinion -- BiOp, in federal lanuage -- expires at the end of 2017, and Simon has given the feds until March 2018 to produce a new one. But substantively, Simon has issued the broadest and most aggressive rejection of a Columbia River BiOp so far. He picks up strong language from his predecessor about federal agencies' "cynical and transparent attempt to avoid responsibility for the decline of listed Columbia and Snake River salmon and steelhead." But he also covers new ground, going into fresh detail about climate change. Joseph Bogaard, executive director of Save Our Wild Salmon, says, "This is a very significant -- and significantly different -- ruling." A week after the decision, a spokesman for the losing party, NOAA Fisheries (aka the National Marine Fisheries Service), declined to comment on it. He said federal agencies at the regional and national levels were still discussing what comes next. Thirteen Columbia River system salmon population have been listed for protection under the Endangered Species Act since 1991. So, the U.S. Army Corps of Engineers, the Bureau of Reclamation, and the Bonneville Power Administration, which operates and sell power from the dams, have had to consult on Columbia policies with NOAA Fisheries, which has had to issue biological opinions. This time around, Judge Simon basically said that NOAA Fisheries had offered up the same old, same old -- and that wasn't good enough. The most recent BiOp, he said, "continues down the same well-worn and legally insufficient path taken during the last 20 years." He also faulted it for relying on "a recovery standard that ignores the dangerously low abundance levels of many of the populations of the listed species." That flawed standard is "trending toward recovery," something the Bush administration dreamed up for the 2008 BiOp and the Obama administration subsequently embraced. Basically, trending toward recovery means that if you have more fish this year than last, you're not jeopardizing the long-term survival of the fish. It ignores the fact that a) it may take a long, long time to get the numbers up to a sustainable level; and b) at low numbers, a population runs a high risk of going extinct. "Without ‘trending toward recovery,' " says Earthjustice attorney Steve Mashuda, "the bar [for future BiOps] is automatically higher." The 2014 BiOp was chock-full of information on climate change, but it was devoid of any specific new action to deal with changing climate. Mashuda pointed out at the time that there were two threats -- the river conditions that have reduced fish runs and climate change -- "and they're using the same bullet on both of them. That just doesn't work." Since then, climate and our knowledge of its effects have marched on. 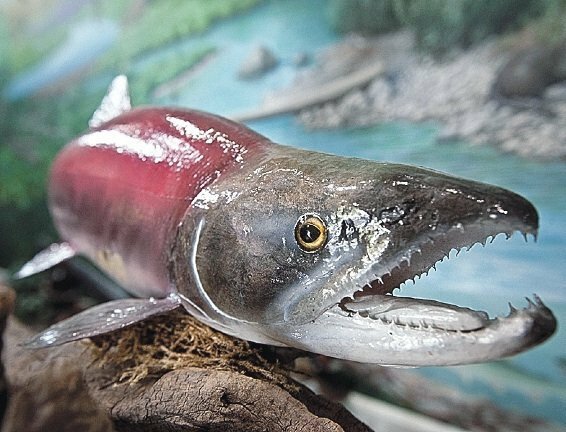 Mashuda now points to last summer when high water temperatures led to the death of nearly half the sockeye that started up the river, including virtually all of those bound for Idaho. Simon's opinion called attention to the BiOp's lack of both new climate information and new proposals to deal with climate change. He said "the court is troubled" by NOAA Fisheries' apparent effort to ensure that "the climate literature reviews . . . bolstered NOAA Fisheries' contention that all new climate information is encompassed by NOAA Fisheries' previous analysis." Simon also said that the feds had to prepare an environmental impact statement. Yes, they had done impact statements in the 1990s, but those reflect information that the judge dismissed as "stale." Opponents have always argued that the feds should at least consider breaching the four lower Snake River dams. Those dams, built in the 1960s and '70s, generate a small but appreciable amount of the region's electricity and enable barges to reach the inland port of Lewiston, Idaho. They also block passage to spawning streams in the mountains of Idaho. The U.S. Army Corps of Engineers barges fish around the lower dams, but salmon population numbers remain low. Snake River sockeye were the first Columbia River system salmon population listed under the Endangered Species Act. Climate change has made the dam issues stark: On one hand, Bogaard says, the dams produce power without generating greenhouse gas. On the other, the high-elevation habitat above them, already protected as wilderness, may eventually contain just about the only spawning streams in the U.S. portion of the Columbia Basin that stay cool enough for fish. Bogaard suggests that the choice isn't, or at least shouldn't be, between saving salmon and replacing the dams with power plants that burn fossil fuels. They can be replaced by wind and solar, he says, at relatively modest cost. Simon didn't order the feds to consider breaching. But he left no doubt that he thought they should. "Judge Redden, both formally in opinions and informally in letters to the parties, urged the relevant consulting and action agencies to consider breaching one or more of the four dams on the Lower Snake River," Simon observed. "For more than 20 years, however, the federal agencies have ignored these admonishments and have continued to focus essentially on the same approach to saving the listed species. … These efforts have already cost billions of dollars, yet they are failing." Now, Mashuda says, if the feds keep dam breaching off the table next time, "they have to come up with some explanation why it's reasonable to not even consider it. I can't imagine how they could justify it." No one has a clue what will happen next. The presidential election might have an impact, but the 2008 election brought no changes. Regional changes may prove more significant. Former U.S. Rep. Doc Hastings, an ardent defender of dams, is already gone from Congress. And time is running out on agreements that the federal government has with state governments and tribes under which the feds channeled a billion dollars to hatcheries and habitat improvements, in exchange for which states and tribes -- but not Oregon, which didn't sign -- agreed not to challenge the BiOp. Those agreements expire next year. What will the state, which has never fought the federal biological opinions, do then? What will the tribes do? Will the congressional delegation keep deferring to the Bonneville Power Administration's desire to continue operating the dams? "A lot has changed in the real world," Bogaard says. "If we're not going to follow the science and law, we're going to wind up doing what we've done."